AMD has announced that it will be working with Qualcomm to create always connected ultrathin laptops. 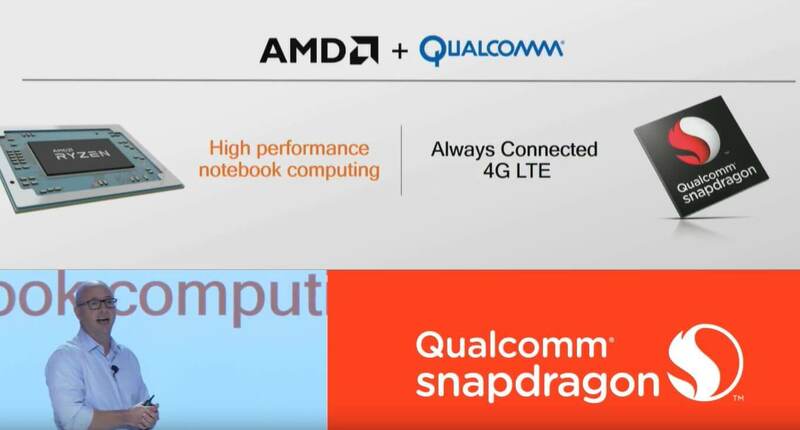 Pairing Ryzen mobile processors with Qualcomm's Snapdragon LTE modem will offer gigabit LTE speeds while maintaining excellent compute performance. Qualcomm is aiming to push the Always Connected PC as a necessity for the future. There are obviously benefits to always having high speed internet access, but having another monthly subscription cost will not sound so appealing to all. Knowing that Ryzen mobile APUs have fairly impressive performance in their own right, adding LTE could place them in a unique market position. According to vice president of client computing Kevin Lensing over at AMD, "Both AMD and Qualcomm have shown a consistent commitment to delivering products that redefine next-generation mobile user experiences." This is not the first time that data connections will be installed in laptops, but it does mark a time when mobile connections can often be just as good as fixed broadband options. The ability to connect to LTE anywhere offers the ability to work from anywhere at any time. Businesses are likely to be interested in the ability to always have access to corporate data. Tablets and phones that already have LTE capabilities may cause some debate over whether fully fledged laptops with LTE are actually needed, but there are certainly customers out there for such a product. Expect to see the first laptops with Qualcomm modems and Ryzen APUs arriving in early 2018.